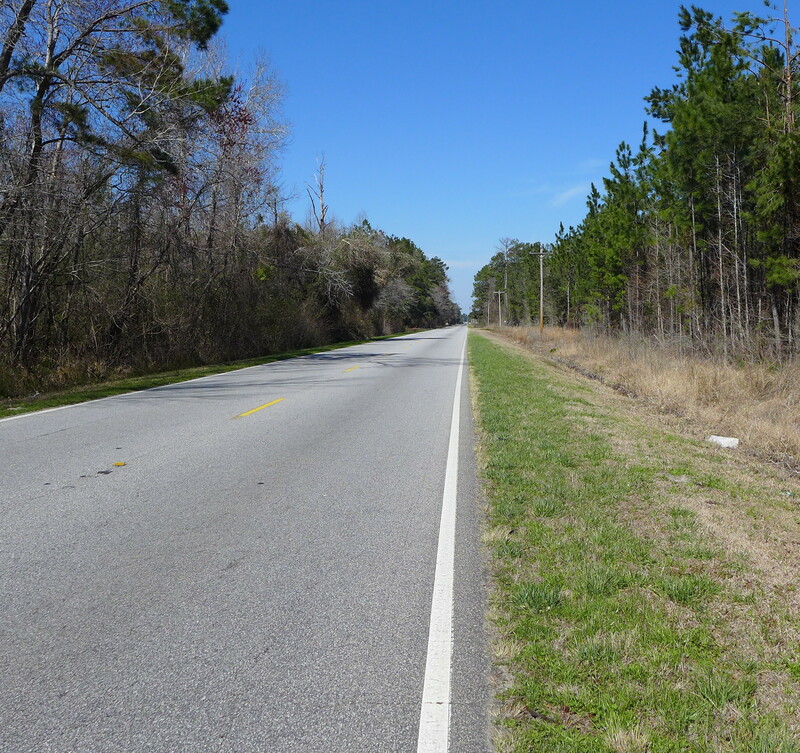 The hinterlands of South Carolina south of Lumberton NC and west of Myrtle Beach, are filled with miles of flat pine forest, crossed by razor straight narrow highways filled with screeching pickup trucks that scare a bicyclist. The bicycling on this trip was mostly a downer. Pickup trucks with knobby tires produce a fearsome roar as they rumble by. In a trip of one night and two days, however, the three meals were definitely more interesting than the roadside scenery. After and long and stressful bike ride from where I parked the Ford Focus in Centenary SC, lunch the first day at the J&J Cafeteria in Conway SC. The meal was a “meat and three” choice of meat plus three vegetables. $ 6.99. One overweight woman across from me was chipping away at a bucket of oysters, shuck them yourself at the table. It looked delicious, I have hardly ever seen oysters served that way at a restaurant. Guns are quite welcome around here. 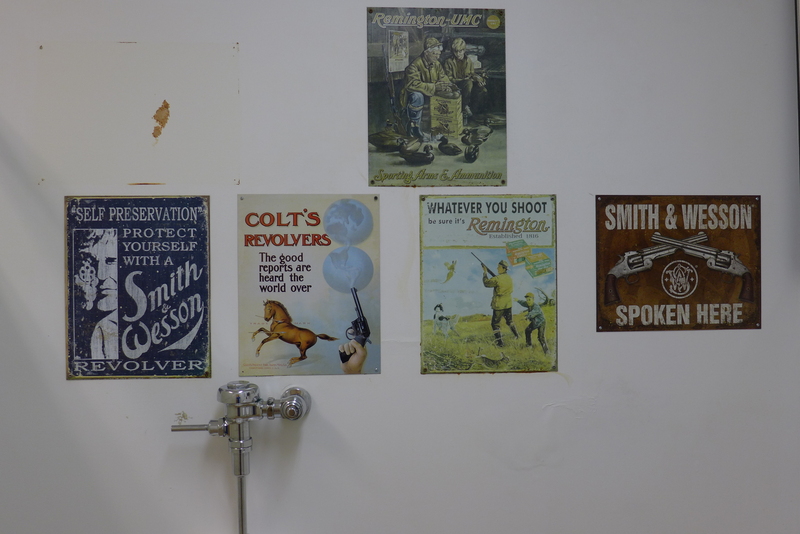 This was the men’s room at the J&J. Forty miles further late that afternoon, I glided into Georgetown, just inland from the coast,. It is an old town, with lots of structures built in the 1700’s; a town with aristocratic Charlestonian pretentions, amplified by all the yachts that stop over there on the way north / south. 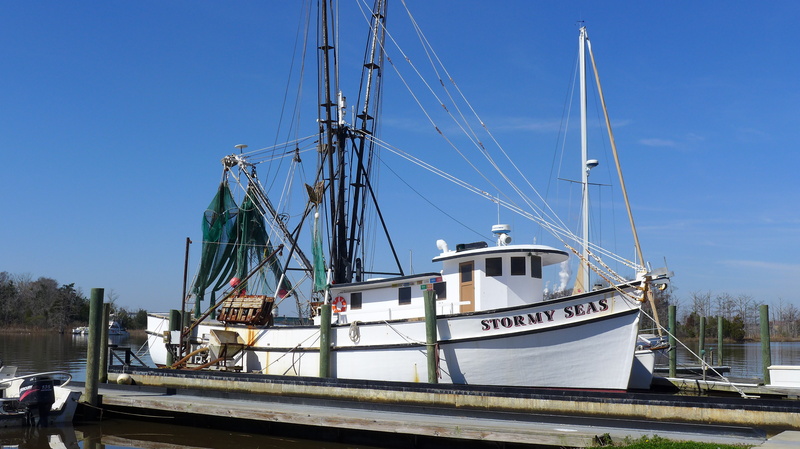 There is a local commercial fishing fleet as well. I got a room by the water at the Hampton Inn. Dinner was at the Rice Paddy Restaurant, about a mile each way by bike in the dark. It is a fine restaurant, by any standard. 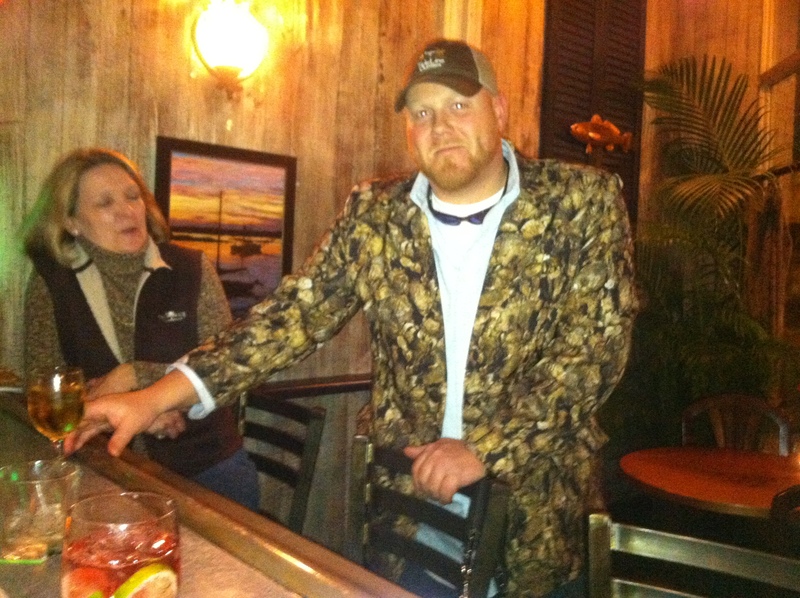 The talk at the bar was about oysters, yachts, trucks, and hunting dogs, in that order. At one point a guy started a tirade on Obama’s position on welfare. The rest of the crowd grunted, and he backed off. I still am not sure if this grunt was in approval, or if it was to encourage him to back off politics and go back to having a good time. One of the guys there was in town to promote his line of camouflage clothing, where the cammo is pictures of oyster shells. Really. I managed to snap a picture with my cell phone. Dinner was so delicious I even got dessert. Bicycling the next day was again stressful, as pickup trucks zoomed by on the narrow roads. Three fourths of the way back to the car in Centenary, I stopped at Kenny’s in Hemingway SC. Everybody in town seemed to be there for the after church lunch. All you can eat, fried chicken, barbecue, green beans, etc.